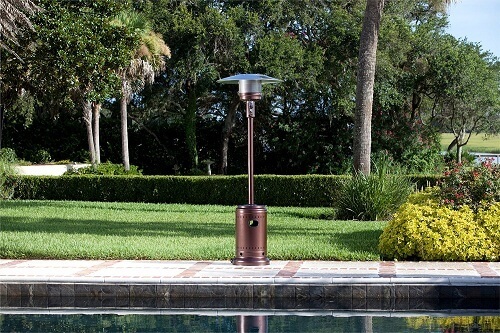 This variety of patio heaters is able to pump 46, 000 BTUs and they reach a range of 18 feet in diameter. Their characteristics are what make them the most powerful outdoor heating tools on the market. Apart from that, you can also carry them away because they come with wheels, which ensures excellent mobility. They might look a bit heavy duty at first glance because they are quite large, but they get the job done. They typically have very stylish finishes, which are meant to mask their size, making them the perfect addition to any backyard. Get the look and comfort with this one of a kind commercial patio heater. 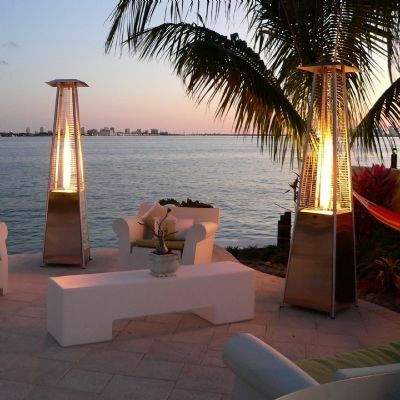 If chic is what you’re going for, then you’ve hit the jackpot with flame patio heaters. Their open fire makes them look cozy and tantalizing. Not only that but when it comes to flame patio heaters, elegance never took the second place. They typically have outstanding finishes and gorgeous looks about them meant to make your garden look fantastic. They can also provide 41, 000 BTUs worth of heat in every direction you choose. Here is a beautiful example. If you happen to have a somewhat smaller backyard, this is the patio heater for you. It’s very light, easy to carry from place to place, and you can store it away with ease. It’s also perfect for entertaining. All you need to do is set it on the table, where it will provide the perfect setting, ambiance, and warmth. It can raise the temperature in the outdoors by 10 to 25 degrees. 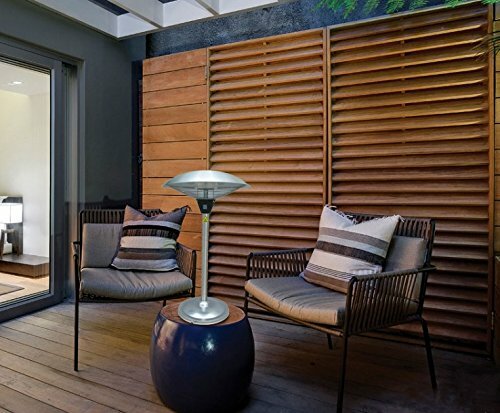 Here’s a gorgeous example of a tabletop stainless steel patio heater. In case you don’t want to keep your outdoor heater in the middle of the table, you can always mount it on a wall or a pole. It runs on electricity, and it has a heating ability estimated to 90 percent. It is also less expensive to operate than patio heaters based on propane, and it can reach its maximum heating capabilities in a matter of seconds. Once mounted, it will heat up space around it in an area of nine meters. It does not release any toxic residue, so there is nothing to worry about as far as safety goes. The most amazing thing about it is that you can also use it indoors. 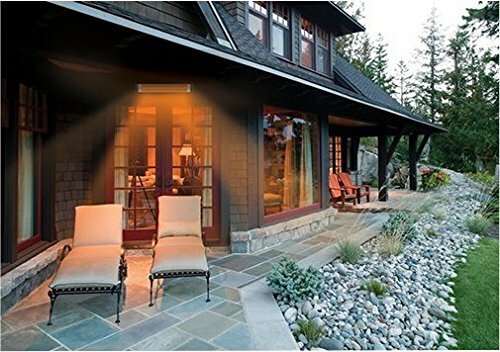 Warm up your backyard with something such as this infrared patio heater. The final entry on our list is a truly remarkable invention. Not only does it provide exceptional outdoor heating, but it can also hide away under any patio umbrella. Consequently, it becomes thoroughly invisible, leaving only the heat to waft away through the air. It works by using electricity, so it will save you big bucks when it comes to heating expenses. You can use it both indoor and outdoor, and it’s very convenient as far as storage goes. Get the technology right here. No matter which one of these patio heaters you choose, our suggestion is that you let technology make your outdoor life easier this cold season. Just because the weather got a bit worse, that doesn’t mean you can’t still enjoy your garden! The Scoop on Patio Heaters: Do They Really Work?